Mangaluru, Dec 07, 2015: Ramakrishna Mission carried out the 29th edition of Swachh Mangaluru Abhiyan in Nagori area on Dec 6, Sunday from 7.30am to 11am. Praveen Chandra Alva, corporator, and Mahabala, president, Garodi Billava Sangha flagged off the 29th drive in the presence of Swami Jitakamanandaji, president, Ramakrishna Math, Mangaluru and Ganesh Karnik, MLC. Mangalore Refinery and Petrochemical Ltd, principal patron of the event sponsored the drive. 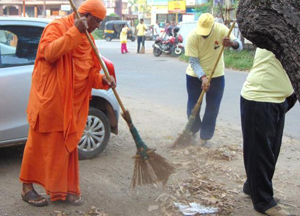 Volunteers led by the Ramakrishna Mission cleaned the Naguri area in the city on Dec 6, Sunday. It was the 29th Swachh Mangaluru Abhiyan by the mission. The team cleared heaps of garbage dumped around Nagori bus stand. Debris, weeds and grass on the sides of roads in the area were removed. An open drainage which was a nuisance and was posing danger to pedestrians was closed using stone slabs. The volunteers also cleaned two bus shelters, removed the posters etc. stuck on walls, and painted the bus shelters. The path leading to Sai Mandir at Naguri was occupied by stone slabs and construction debris and was obstructing the way, posing major hurdle to devotees and pedestrians frequenting the mandir. Volunteers removed the slabs and debris using an earth mover and cleared the path. Direction boards including the main board mentioning the location of Naguri were cleaned and repainted thus it a neat look. Group of Art of Living under Sadashiv Kamath, another group of devotees of Garodi Temple under Kishore Kumar, students from government first Grade College under Mahesh K B and Sheshappa Amin, volunteers from Patanjalai Yoga Shikshana Samiti, volunteers from Nivedita Balaga under Rathna Alva/Sheela Shetty actively participated in the abhiyan. Volunteers distributed handbills on Swacch Mangaluru Abhiyan to generate awareness among localites in the area. What is the need of publicity? Some are not aware of the what is happening around. In the city there are some roads where the roads are neatly tarred but a sudden ditch which is very dangerous Un till some incident occurs no one cars about it.